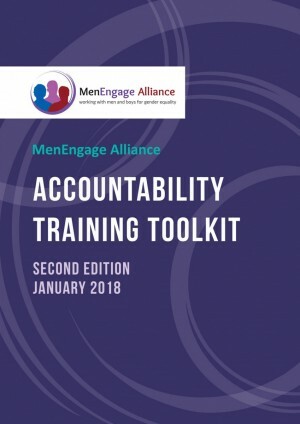 The training toolkit was developed to complement and put into practice the Accountability Standards and Guidelines of MenEngage Alliance. Through critical dialogue around what it means to be accountable to women’s rights and other important stakeholders, individuals and organizations will be able to define ways in which a culture of accountability can be promoted in their own actions, organizations and networks. Above all, these efforts are underpinned by MenEngage Alliance’s commitment to act in accordance with our Core Principles and Code of Conduct, and ensure that members act in a manner that upholds the integrity of the Alliance and our collective work. aid organizations in developing concrete strategies for prevention and response in cases of breaches of good conduct. The toolkit also provides key definitions, a tool to develop a timeline for implementation, and another tool to conduct a self-evaluation. The intended users of this toolkit are individuals, organizations and networks belonging to MenEngage Alliance, but it will also be useful for others working in the field of engaging men and boys for women’s rights and gender justice. The toolkit can be implemented as a three-day workshop session, or one session at a time over a one-week period. It can be implemented at the organizational level (i.e., with other staff members and implementing partners), and/or at the national or regional level, such as with members of a MenEngage network.